‘Point of no return’ for smart buildings | BSRIA Blog - Opinions and insights from BSRIA Limited. I have just returned from the IBcon conference in Orlando, Florida. And what an event it was! A hive of activity, it proved to be a great networking and educational experience, with some of the most innovative smart building owners, operators, specifiers and suppliers in the industry. A key feature of the event is how it successfully brings both the supply and demand side together under one roof. Attendees were spoilt for choice for which educational track to join (some 9 separate tracks each running some 3-5 panels per day) on every subject from smart metering, through smart grid, to energy management services and building system cyber security (or lack of it…), to name just a few. I personally wanted to divide myself up and join all of them! Attendees were primed for these two content-rich days by an excellent and comprehensive launch through the IB Bootcamp, where presenters delivered a series of presentations, showcasing smart building case studies, latest technologies and future visions. In addition to this, there was good participation from suppliers in the exhibitor’s hall, and the fact that the event is co-hosted with Infocom means that there are many more people to visit and to be visited by. The big themes of the day were Social Media, Mobility, Analytics and the Cloud, and their impact on the smart, connected buildings community. 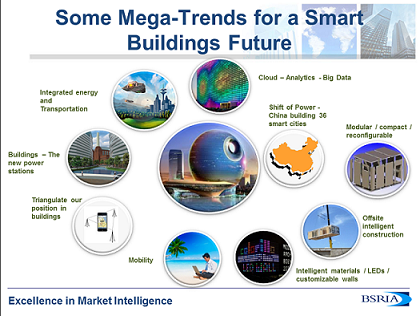 Each of these is already having a significant impact on our definition and understanding of a smart building and its meaning in the context of smart cities. It is clear that this goes well beyond the realm of energy efficiency and energy management, important though these are. It is also about operational efficiency, occupant satisfaction and productivity. However, building owners are seeking an improvement in installer messaging when being presented so many energy saving tools and practices by so many different suppliers. Now we can truly include in the wider frame, the voice of the end user (wherever they happen to be located), the impact of tens or even hundreds of thousands of data points being monitored and analysed daily, in real time, to generate big data trends on which to base solid business decisions and increase the value of an asset. I was part of a panel in which there was general consensus that the industry has now “crossed the chasm”, or in other words, reached a critical “point of no return” for smart, connected buildings to become mainstream. These buildings provide significantly higher value to their users and greater returns for their owners. There are now real world examples that can be cited and the “Internet of Everything” is starting to become tangible, moving from hype to reality. Senior Manager – Energy & Smart Technologies at BSRIA. BBA (GSBA Zurich), Betriebsoekonom dipl. oek. 30 years’ experience in intelligent building controls, fire and security systems. Educated in the UK and Canada, and trained as a building controls engineer with Honeywell Control Systems in the UK. Moved through a series of international sales and marketing roles at Landis & Gyr (now Siemens Building Technologies) in Switzerland and then marketing manager for employee time scheduling and access control systems at Amano Blick International Ltd (now part of Stanley Security group). Bachelors degree in Business Administration. Joined i&i-Proplan in 1999 as a Senior Consultant and managed market research projects in building controls, fire detection/alarm, and electronic security systems until its acquisition in 2008 by BSRIA. Since Mar. 2013 managing the BSRIA Energy and Smart Technologies team. Languages: German, Spanish and English (mother tongue).